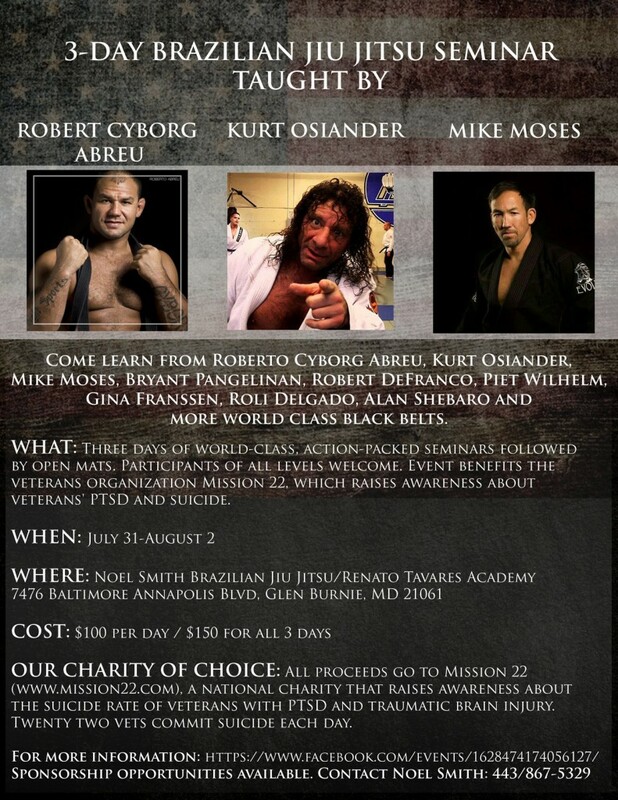 Come learn from Roberto Cyborg Abreu, Kurt Osiander, Mike Moses, Bryant Pangelinan, Robert DeFranco, Piet Wilhelm, Gina Franssen, Roli Delgado, Alan Shebaro and more world class black belts. What: Three days of world-class, action-packed seminars followed by open mats. Participants of all levels welcome. Event benefits the veterans organization Mission 22, which raises awareness about veterans' PTSD and suicide. Our Charity of Choice: All proceeds go to Mission 22, a national charity that raises awareness about the suicide rate of veterans with PTSD and traumatic brain injury. Twenty two vets commit suicide each day.